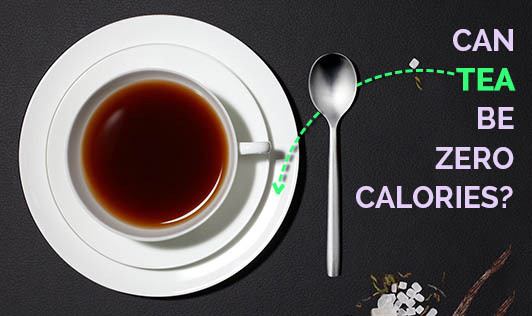 Can Tea Be Zero Calories? The Indian way of making tea is similar to the British - we drink tea with milk and sugar. The calorie value of a cup of tea depends on the amount of sugar and milk that you add. For example, 1 cup (150 ml) of tea which contains 30 ml of milk and 2 tsps sugar would give you 62 calories. In case of iced tea, sugar provides the calories and the sweetness. Can we drink a zero-calorie tea? Certainly, just don't add milk and sugar to your tea. Tea decoction all by itself, does not contain any calories. It's the milk and sugar that add calories to every cup that you drink. Black, green tea, white tea or oolong tea - whatever the variety maybe, they contain zero calories. That might be one of the reasons why Chinese and Japanese drink several cups of green tea a day without having to worry about calorie intake through tea. Moreover, green tea also contains lots of antioxidant goodness. In Japan and China, tea ceremony is an elaborate process where tea is brewed slowly and gently. It's served to family members and guests, and believed to be a way to connect with everyone and express gratitude to the elders. Try a cup of black tea next time...make it weak and you might begin to like it!